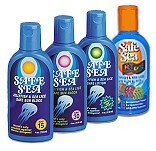 Sea Lice Repellant for Sea Nettles and Jellyfish Stings. Pamper yourself with our 2006 Body Service selection! These products are proven best-sellers from previous seasons, back by popular demand. Designed to keep you looking and feeling your best, items from the Solar Tan Thru Body Service line are the perfect complement to your new swimsuit! HELPS PROTECT AGAINST MARINE STINGS! , sea nettle, most jellyfish, and fire coral. The waterproof formula is available with or without sunscreen.